As any parents of a young child who is a problem sleeper will confirm, permanent tiredness and constant irritability can put a huge strain on your relationship. In fact, according to a survey, lack of sleep is a big factor in divorce and separation for a third of couples. Ahead of a new series on the subject, a poll carried out for Channel 4 suggests the average parent surveyed got fewer than six hours of sleep a night. It also found that three in 10 couples who had split up said sleep deprivation since having their child was a factor in the breakup. Nearly 45% said they had dozed off in a place they shouldn’t have or was unsafe, with one in 20 admitting to falling asleep at the wheel of their car. Sleepless nights caused by a crying baby are blamed by parents for the breakdown of up to a third of relationships, research shows. Parents with a young child get about six hours sleep a night, an hour less than is recommended. Experts also say that adults need at least five hours’ uninterrupted sleep to be able to function and concentrate properly the next day. A survey of 2,000 parents found that 30 per cent of those who had divorced or separated blamed sleepless or interrupted nights caused by their children. This particular story is a little thorny and a little tricky to unpick. 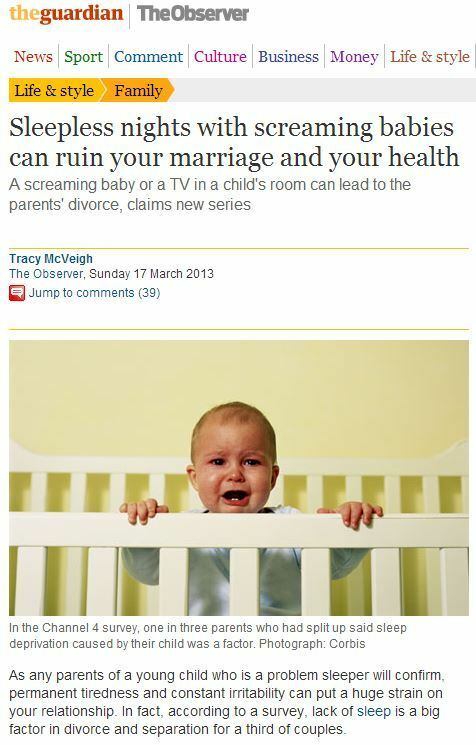 For one, the Observer article (if not the Mail) makes it clear up front that this research came from the TV show ‘Bedtime Live’ – in fact it was release specifically to promote the show. Another complication is the involvement of respected researcher Dr Tanya Byron, who appears to do robust work. Perhaps, then, this isn’t simply a case of spurious researched being used to prop up the advertising for a TV show? Perhaps this is legit? ‘I see people whose children have chronic sleep problems and they’ll say things like their children get really upset if they try to send them to bed. ‘Well, I promise you, they won’t hate you in the morning when they’ve had a proper rest. ‘Our generation struggles with discipline much more than any other, but the lack of boundaries will only cause more and more difficulties. ‘From a clinical perspective, a lot of those I see in my own clinics, predominantly children, have underlying issues with not getting enough sleep, even if that isn’t the problem they are presenting with. 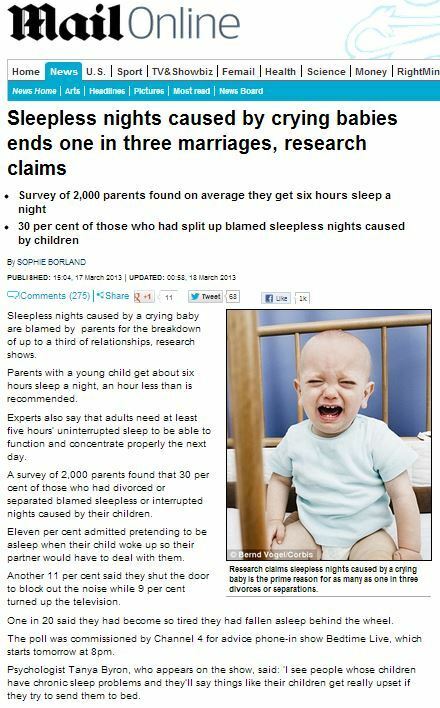 As you’ll see, this says nothing at all about the headlien claim that researchers discovered how sleepless nights lead to divorce – this, clearly, is a quote from Dr Byron on her participation in the show. Instead, the ‘research’ which uncovered this startling fact was an online poll conducted, I believe, via Bad PR regulars OnePoll – I certainly took part in a very similar survey on their site recently. If so, I’d consider the headline-grabbing statistic that marriages are ending over sleepless nights and crying babies to be highly suspicious. What’s more, if I were Dr Byron, I might want to have a word with the show’s producers, to make sure future press releases made it very clear which claims came from the academic and which from the PR machine. This entry was posted in Uncategorized and tagged bedtime live, channel 4, daily mail, guardian, observer, sophie borland, tanya byron, tracy mcveigh on March 28, 2013 by Michael Marshall.